The problem is that building a community isn’t easy. Building an engaged community, meanwhile? Well, that can be even trickier. The good news is that if you do the right things and come at this with the right mindset and right intentions, you can turn your social media platforms into places where your customers come together to share your brand experience with you. 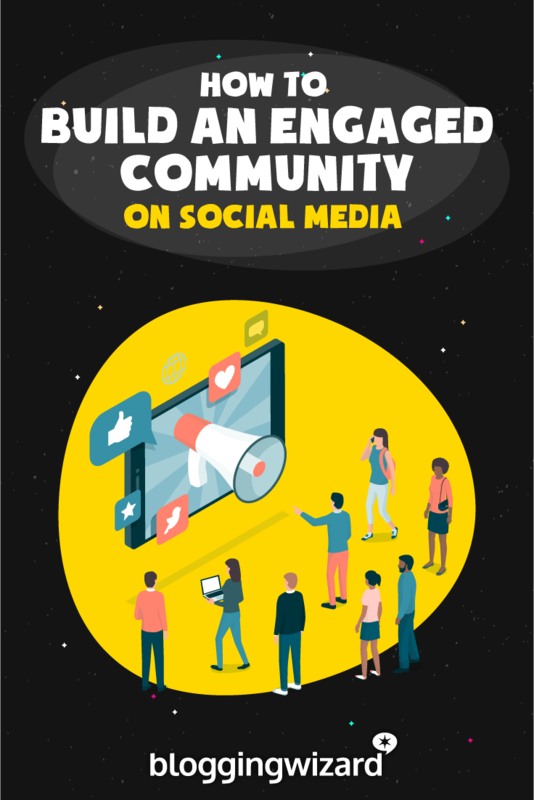 In this article, we take a look at the ultimate guide to building an engaged community on social media. If you’re the superstar celebrity who refuses to do interviews and connect with your fans, you will lose out. Communication is super important to your success here, with studies showing that 57% of consumers will stay loyal to a brand if there was more human communication. If you want to build a proper community, you can’t hide behind your website any longer. Instead, you need to make your messages feel like a proper human conversation. If your followers don’t know how to have a conversation with you, or if they don’t even know they can have a conversation with you, you won’t have a community. Communication is going to be the foundation of all that you do, which means you need to make it really easy for your followers to talk to you. At the same time, how you communicate on each channel will be different. The way you communicate on Facebook will evoke a difference response if you tried the same method on Twitter. It will fall flat. Facebook Messenger will continue to be a big deal in 2019 and beyond. When someone arrives on your page for the first time, make sure there’s a pinned post at the top of your timeline that lets them know what your page/community is all about and how they can contact you. Utilise Facebook Click-to-Messenger ads, too. Each time a user clicks your ad, a chat box will appear that invites them to chat with you on Messenger. Not got a Facebook group yet? Now is the time to create one. A Facebook group is a great place to gather your community together. Then, you can reach out to your whole community directly via live Q&A sessions and other types of content in which you directly ask your community if they have any questions for you. Make sure to engage with your community by responding to their comments and creating a lighthearted (but serious), positive and even fun atmosphere that people feel right at home in. As the group grows, hire community leaders and moderators who will help you keep a tight ship. Don’t forget to learn how to manage your Facebook group, too. Twitter can be great for drumming up business, but you shouldn’t use it simply for business reasons. Engage in social listening, find the conversations that are happening among your followers and get involved. Chat to them and ask questions. Learn more about them and show them that you’re interested in what they have to say. Remember, now that you have a community it’s not about the product – it’s about the people. Instagram Stories is a great place to hold conversations with your followers. It’s one of the best places to show your human face and really build your community. Make sure the questions are fun and easy to answer. It’s a great way to get people involved. 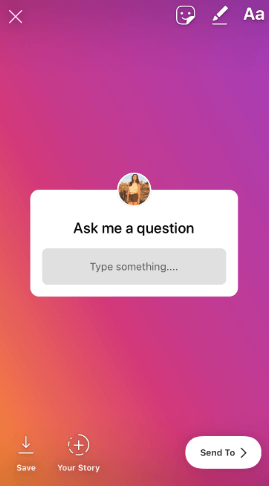 You can also use Instagram Stories to collect the most popular questions your community has about you and your brand. Using question stickers to solicit feedback, meanwhile, opens up more opportunities for easy communication. Question stickers are a fab tool that let your followers speak up about what content they want to see more of, as well as what they love and what they don’t love about what you’re doing! I really like a messaging app called Drift as it lets you converse with your website visitors in real time. You can use Drift to say “hello” to your site visitors and get a conversation going. This is really important as most website visitors exit without doing anything. By using Drift to create a 1:1 personalised conversation with your visitors, you can engage them there and then, uncover their pain points, learn more about them and convert leads into engaged members of your social media community. The more you know about people, the better you can service them. Chatbots and virtual assistants in general are obviously great for answering customer queries really quickly, solving problems and even collecting important data on your customers. But when it comes to building an engaged community, you need to remember the human touch at all times. Your followers need to know that you care. Simply answering everything via a chatbot ultimately shows a lack of care. Sometimes, it’s good to reach out to your audience directly via email or telephone. Building an engaged community isn’t really about grabbing peoples’ interest. That’s short-term thinking. Social media isn’t a place where you should be indulging in shameless self promotion. On the contrary, people will only engage with you if you provide them with lots of value. And value starts and ends with problem solving. In other words, if you want to build a real sense of community among your tribe, you need to solve their problems. Use social listening to uncover your audiences pain points. Ask questions on Facebook – “How can I better help you guys out?”. Host Q&A sessions on Instagram and find out what your community members are most struggling with. Your aim is to gather as many community pain points as possible before addressing them via content. You can create awesome blog content that educates them and helps them overcome obstacles they’re facing, and you can also leverage influencer marketing to better address your community’s pain points. Find an influencer in your niche who’s an expert on a particular topic, before working out a way to work with them on co-created content that tackles the topic head on. 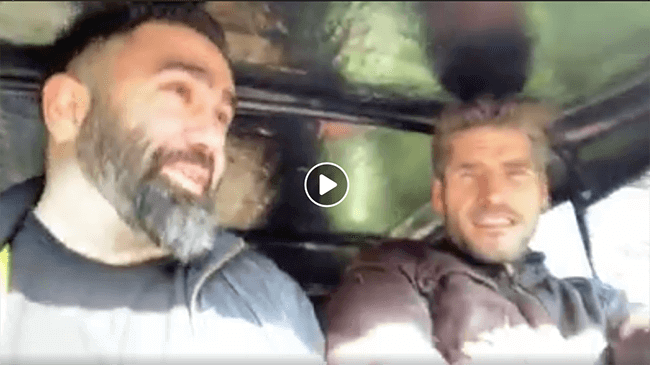 This is something entrepreneur Dan Meredith did recently when he teamed up with fellow entrepreneur Jamie Alderton to provide double the value to his Facebook group. And as might be obvious from the image, they both provided a dollop of fun to the group, too (and fun is an excellent way to engage your community members). For more information on influencer marketing, check out this resource. When you’re providing value, always remember to put people first and your brand second. Visuals are a great social media asset. Infographics allow you to provide lots of useful information and stats to your community via a cool-looking image. You can use a tool like Piktochart or Venngage to get started. Scared of reusing old content because it might make you look unoriginal? Don’t be. Internet marketer Gary Vee is constantly posting old content that reaffirms his message, and which continues to pile on the value factor to his audience. If old content is valuable and helps people out, don’t worry about reposting it. You can always tweak it to make it more engaging. Read a great book recently that your community could really benefit from too? Tell them about it on social media! Share your thoughts and a link to where they can get it from. It’s the same with any podcasts or Youtube videos you’ve been watching lately. 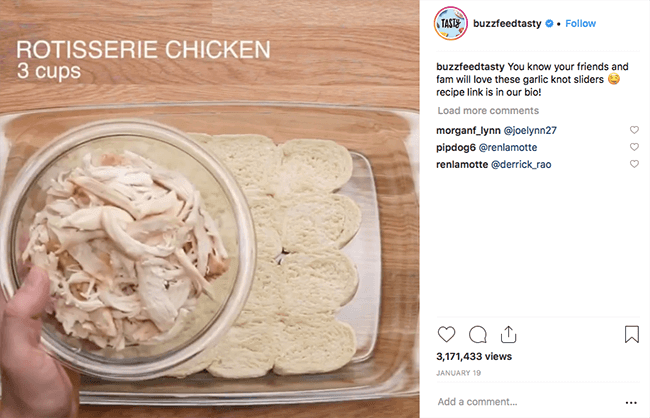 If you’ve recently hosted a Q&A session and answered a pretty important question, it’s a good idea to create a new social media post that zones in on it. Highlight it so that no one misses out and do this as often as possible. However you choose to add value, always remember to be positive, engaging and fun. I firmly believe that the more you give, the more you’ll get back. Remember, few people really care about your brand. But they will start to care about you the more you give. While you’re not here to be Mother Teresa, and while your own time is undoubtedly precious, you should look to be generous with your community. It’s your community who is giving you their time by posting, commenting and offering value to the other members. Giveaway contests, such as sweepstakes, have been engaging communities for centuries. 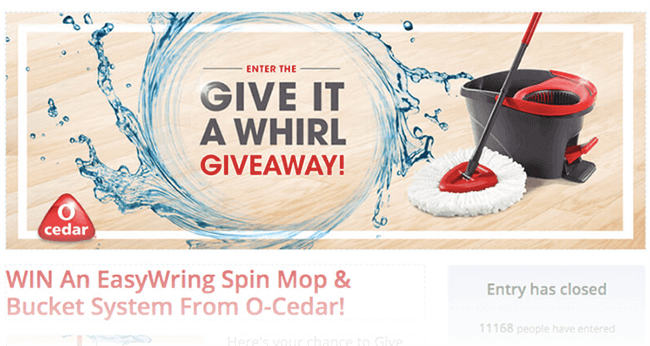 In social media, it’s easier than ever for a brand to run their own giveaway contest. Such a contest boosts engagement among your community, raises awareness of your brand, and it can also convert leads. With a giveaway contest, you need to make sure that the terms of your contest are clear, and that the prize is relevant to your brand. It’s important that your visuals are professional (you can use a tool like Design Wizard to help you out here) as it’s the visuals that will probably catch your audience’s attention even more than the prize itself. Giveaways can be super successful. The one below had a conversion rate of 45.69%. To create your own giveaway contest on Facebook, first decide on a prize. Because your community members will be handing over their personal information for this contest, the prize needs to be worth it. Then, decide on a theme. For example, will you tie it in with a national holiday or Christmas? Or will you tie it in with a major sporting event, such as the Super Bowl? Then, build your giveaway page using a tool like WishPond before publishing. From then on, you need to promote your contest on social media. Change the banner images on your Facebook, Instagram and Twitter accounts to raise awareness and send emails to your current subscribers. Lastly, use a giveaway app to pick a random winner. If you’ve got a Facebook group, the top contributors are your most dedicated fans. They’re the ones who engage with your posts the most on social media. They’re awesome and you’ve gotta treat them well. To show your whole community that you appreciate your top fans, take a look at your Group Insights in the left sidebar menu of your group. Then, open up Member Details. This section will show you who your top contributors are, including how many comments they’ve left, and how many posts they themselves have created. Then, create a new post that highlights your top contributors and give them a prize. It can be anything that’s of value to them. Ideally, you might want to tie it in with your brand – you could offer them coupons – but you could offer them absolutely anything that’s going to benefit them and make them smile. Not only will this make them feel good, but it will also make the rest of your community feel good, too. Your passion is your passion. But if you want to create an engaged community on social media, you need to make it your community’s passion, too. The easiest way to do this is via user generated content. User generated content is when your own customers generate content for you, thereby turning into micro influencers and brand advocates. It’s an excellent way to build an engaged community and organic reach. In terms of social proof, there’s really nothing better. Plus, it’s super exciting and fun for your followers. 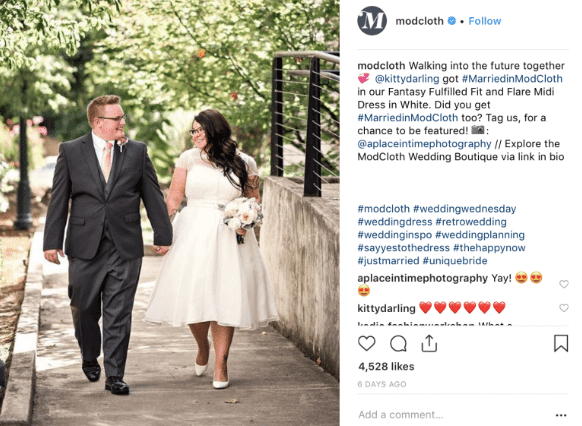 Share photos and videos of your customers using your products – This is exactly what Modcloth did when they shared their customers’ photo on Instagram before adding a caption and tagging the happy couple. Make sure to add a call to action when you do this so that your community knows they’ve got a chance to be featured by you. Create a multiple image post – Let’s say you’ve got lots of members of your community who have all shared images of themselves enjoying your products or services recently. Why not bring them all together in a single multiple-image post? If you’re doing this on Instagram you could even turn it into a video slideshow. 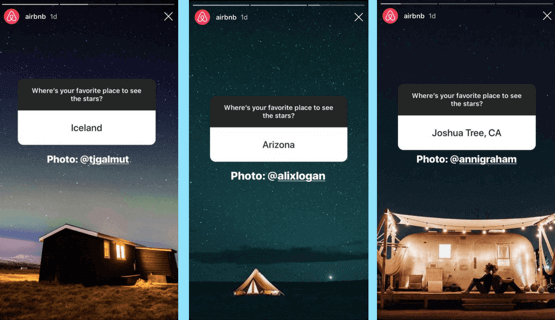 Add user generated content to Instagram Stories – If a member of your community tags you in their Instagram Story, make sure to reach out to them instantly. Ask if you can add it to your own Instagram Stories! For more tips on how to create awesome user-generated content, check out this resource. As well as user generated content, you should also make it a point to keep your community up-to-date with your journey. Create behind-the-scenes videos of your business and showcase where you’re up to and what you’ve been doing recently. Show them the kind of photos that brands usually keep hidden away. Create posts that document your average day – show them what you’ve been doing today, and what really goes on at a business like yours. If you keep everything hidden away and show your customers only your finished product, you might have lots of customers but you probably won’t have a community. Be open, enthusiastic and passionate. It will help you create a more passionate community. Earlier, I wrote how few people really care about your brand. Yet by practising the art of giving, you can make them care more about you. You can also make them care more about you by telling your story. Something we haven’t yet touched on is the need to make an emotional connection with your audience. Once you can do that, you’re well on your way to putting together an army of loyal followers. To ensure that you’re not just “another” company that people buy their products from, you need to demonstrate what’s unique to YOU. In other words, what’s your story? Your story is what creates an emotional bond with your audience. It’s where they see your values resonating in their own. Gary Vee is constantly telling his story to his followers. 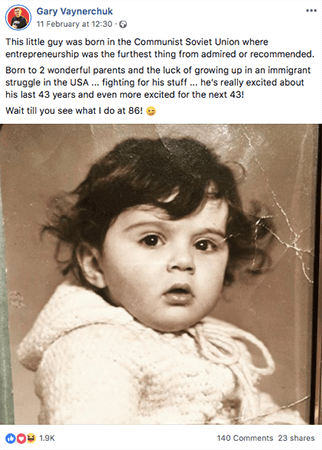 Here it is in a nutshell: His family fled a Communist country for the U.S. when he was a young boy, and the ‘American Dream’ suddenly became a reality. Instead of suffering under Communist rule, he was given a chance to achieve financial independence if he decided to take it. His subsequent gratitude has helped shape who he is today. Gary likes to remind his community of this story a lot. As you can see from the image below, he doesn’t need to create huge posts each time he tells us his story. Instead, he posts short snippets that remind us of his background, where he’s come from, what he’s grateful for – and how others should practice the same gratitude as him. It’s all about building short posts and updates that tie into his main narrative, and this is something you can easily do, too. Decide what your story is – what makes your brand unique – and then create a series of posts that build into that narrative. There’s no need to stop. Keep weaving your story into your updates as you go along throughout this year and beyond. Your followers need to empathise with you if you’re to turn them into a switched-on community, and they can only do this if you show them who you really are and what you stand for. Once you’ve got your story, you should aim to drop your narrative into various updates across your social media channels. Show your community how you’re growing; how you’re learning, how far you’ve come and where you’re going. Using the tips in this article, you can grow your community on social media. Instead, it’s something that should be done out of love. You need to be genuinely passionate about what you do, and passionate about who you do this for. Learn to love your community, give to them, involve them and excite them, and they will give you back a thousand times in return. And, as you go along, don’t forget to keep monitoring your social media presence. Kas Szatylowicz is a social media manager and outreach coordinator at Nightwatch — a search visibility tool of the next generation. Check out the Nightwatch blog and connect with her on LinkedIn or Twitter: @KasSzatylowicz.